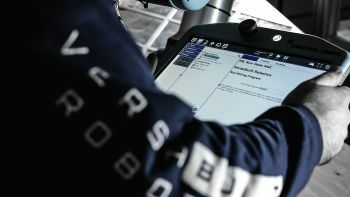 Manufacturers struggling to get CNC machines to communicate directly with their collaborative robot now have a solution: VersaBuilt's CNC Communication, URCap, is a simple yet powerful interface for machine tending applications with Universal Robots. The URCap allows a UR cobot to easily execute any machining program stored on the CNC directly through the cobot's own teach pendant. Initially launching for Haas CNC machines, VersaBuilt will develop UR interfaces for other popular CNC makes later this year. 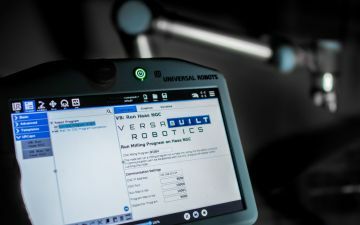 "VersaBuilt is excited to partner with Universal Robots to provide machine shops with automation solutions designed for high mix CNC manufacturers," says Albert Youngwerth, CEO of VersaBuilt Robotics, a company helping machine shops automate thousands of part numbers of all shapes and sizes in turning and milling applications. Another testament to this mission is VersaBuilt's patented MultiGrip™ workholding system, soon available through the UR+ platform. MultiGrip™ includes an automatic vise, machinable jaws and an end-of-arm tool for the UR robot. MultiGrip™ was developed to address the frustration experienced when working with traditional robot grippers and CNC vises. "We ended up asking ourselves: why can't the robot and CNC use the same jaws?" explains Youngwerth. His team developed the unique workholding system that allows the robot and the CNC to share a set of MultiGrip™ machinable jaws for infeed, outfeed and CNC machining, resulting in reduced engineering costs, easier robot programming, faster setup time, and enhanced processing capabilities. Regional Sales Director for Universal Robots' Americas Division, Stuart Shepherd, emphasizes the importance of better integration tools for cobots and CNCs. "CNC machine tending is one of the most popular tasks to automate with collaborative robots," he says. "But there's still hurdles to overcome in achieving seamless integration. VersaBuilt's two new products are important tools in addressing this. We're excited to welcome them to the UR ecosystem and share their solutions with the ATX audience."